You get a lot of skin care products in the market. But they are not as good and effective as the homemade skin care products that you make at home. When you make them at home, you use natural ingredients. As result, they are free from any chemicals and preservatives. It also saves your money. You can make moisturizers, scrubs and cleansers at home and you will find how effective they are. Face scrub is important when you take care of your skin. It helps in removing all impurities from your skin and provides you a healthy skin that is soft and supple. It also helps in maintaining the youthfulness of your skin. If you have a dry skin, here are a few face scrubs that are good for your skin. You get almond meal easily from any store. But it is best to make it at home. You can make it easily on your own. Take a few raw almonds and grind the till you get finely ground almond meal. Take one cup of almond meal and add ½ a cup of almond oil or olive oil to it. You can also add a few drops of essential oil to it. Some of the essential oils that you can use are rose, lemon, lavender and other such essential oils. These oils help in making your scrub more luxurious and effective. Apply this scrub all over your face and scrub your face gently in circular motions. You can wash with cold water and then pat dry your face. Almond is rich in vitamins and excellent for your skin. Olive oil keeps your skin moisturized, soft and smooth. Coffee grounds are good for all types of skin. They help in revitalizing your skin and keep it healthy. They are very effective for dry skin. 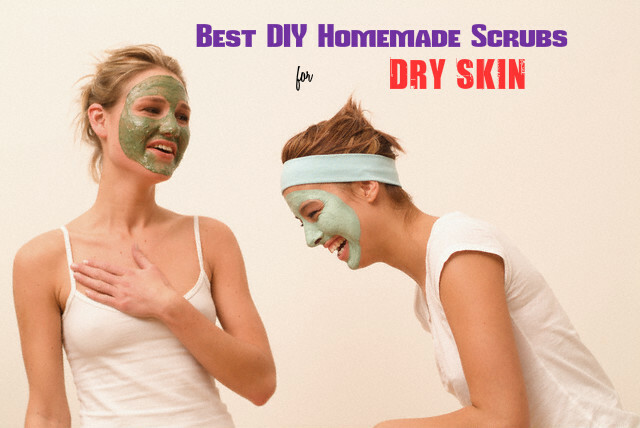 This scrub is one of the simplest face scrubs that you can make at home for treating dry skin. To make this scrub, take some coffee beans and grind them. Take 1 tablespoon of ground coffee and 1 tablespoon of water. Mix them well and apply this on your face. Scrub it on your skin gently with your finger tips in circular motions. Continue scrubbing for 5 to 6 minutes. Now you can rinse it off with water. Pat dry you skin after washing. This scrub helps in exfoliating your skin in a natural way and removes all dead skin cells from your face. This makes your face look clean and fresh. Coconut has been used for the skin for ages and it is a good skin tonic. Lemon helps in exfoliating your skin and makes your skin soft and fresh. For dry skin it is best to use oil based scrubs. Pour ½ a cup of coconut oil in a small bowl. If you have no coconut oil with you, then you can take almond oil or olive oil instead of coconut oil. But do not use peanut oil, vegetable oil or canola oil for making this scrub. Add 2 tablespoons of sugar to the oil and mix both of them well. Now add 1 tablespoon of lemon juice to the mixture and mix well. This way you can increase the cleansing properties of the scrub. Wash your face and apply the scrub all over your face. Massage gently in circular motion for a few minutes and then wash off by splashing some cold water on your face. Take some lukewarm water and splash it on your face. Take a soft cloth and scrub your face gently to dry. Now take a small bowl and put 1 tablespoon of cleansing cream into it. Add 2 tablespoons of finely ground sugar to the cleansing cream. Mix them well so that you get a gritty paste. Apply this on your face and scrub gently in circular motion. Make sure that the scrub covers the fine lines, dry spots and sides of your nose. Remember not to apply it on your eyes. Now take a wash cloth and wet it in lukewarm water. Use this wet wash cloth to remove the scrub from your face. After removing the scrub, splash some cold water on your face. This scrub is excellent for dry skin and helps in closing your pores and making your face look fresh. Use a soft towel to dry your ski after splashing cold water. Green tea is excellent for your skin. It plays the role of an anti-aging agent and keeps your skin look young and fresh. It is great for reducing blemishes, winkles and also to repair scar tissues. To make this scrub, brew a mug of loose green tea that is extra strong. Take 1 tablespoon of this green tea and put it in a small bowl. Let it cool down for few minutes. Then add 1 tablespoon of sugar to it. Stir well and add 1 tablespoon of honey also. Mix all the ingredients well. Honey is known for its antibacterial and moisturizing properties. Apply the scrub you have made on your face and pay special attention to the spots that are dry. Wait for a few minutes and then take a wash cloth and remove the scrub from your face. Wash your face with plan water. These homemade scrubs are very easy to make and not very expensive compared to the skin care products that you get in the market. So, stop spending large sums of money on such products and start using homemade products. These keep your skin young looking, soft and glowing without causing any side effects.